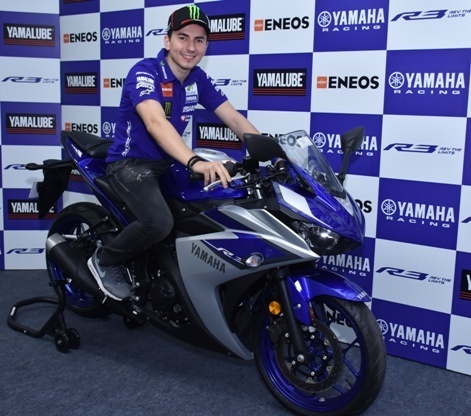 In order to promote motorsport in India, Yamaha motor India brings the current and three times World MotoGP Champion Jorge Lorenzo at the Buddh International Circuit. The MotoGP Champion’s visit to India was primarily aimed at cheering up motorsports enthusiasts in India, to build a more sustainable motorsports fan community; and create interest amongst young sport enthusiasts into this field. As part of his visit to the Buddh International Circuit, Lorenzo also met 30 lucky R3 owners, who got an opportunity to share the same track with the champion racer as he participated in a glory riding session with them. Apart from Lorenzo, Yamaha has also hosted MotoGP legend Valentino Rossi during the 2010 Auto Expo. Lorenzo rode the recently launched YZF-R3 and was all praise for the bike. The R3, since its launch has received rave reviews from reviewers as well as customers and this has resulted in huge surge in sales in the last couple of months. Yamaha in its bid to encourage youngsters to take up motorsports offers great deals to budding racers as part of its philosophy of promoting motorsports in the country. “I am extremely happy to be back in India. I had a great experience during my last visit and this time has been no different. I had a great season this year and I would like to thank all my fans in India and world over for their continued support. 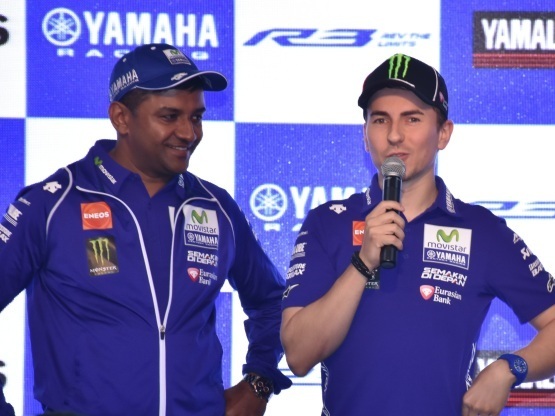 I would also like to thank Yamaha for organizing this visit and also congratulate Team Yamaha on our 17th world championship win”, said the current world MotoGP champion Jorge Lorenzo. “I would like to see more people in India getting into motorsports and I am positive that with the kind of passion and enthusiasm they have, we will definitely see India as a major force in motorsports in times to come. I would also like to add that the BIC is the fantastic track of international standards and riding the YZF-R3 with Indian race enthusiasts was a great experience. I would definitely like to come back here”, he added. 28-years old Jorge Lorenzo joined the MotoGP Yamaha Factory Racing Team in 2008 as double 250cc World Champion, having won the title for the previous two years. Following his outstanding debut year, Lorenzo came of age in 2009, winning four races and pushing his team-mate Valentino Rossi to the limit throughout a superb season. The 2010 season saw Lorenzo build on his 2009 successes, fighting at the front to dominate the season and take the World Championship title. In 2012, Lorenzo became the first Spanish rider to win multiple premier class titles, and is as of 2015 the Spanish rider with the most wins in MotoGP. Racing has been in the heart of Yamaha ever since the company was formed in 1955. Yamaha has also set a number of milestones in the racing world, becoming the first Japanese manufacturer to win a 500cc Grand Prix (with Jarno Saarinen in 1973) and the first Japanese company to win the 500cc World title, with Giacomo Agostini in 1975, the first time a two-stroke machine had won in the premier class, showcasing the company’s then standing as the leading manufacturer of two-stroke equipment.